It has been a frustrating Summer, dominated by Brexit and trade wars. World markets have diverged, with the US powering ahead and Emerging Markets slumping with full blown financial crises in Argentina, Turkey and Venezuela. Despite this, the global economy is in good form with robust growth in the USA, improving growth in the Eurozone and solid growth in China. Faced with such a backdrop, this would be an unusual place from which to start a bear market, but we are in unusual times. In the USA, the outlook looks positive for both spending and employment, but the lack of available labour does appear to be holding back growth. The unemployment rate in the US is now 3.9%, levels last seen in 2002, the mid 50’s and late 60’s. Consequently, the balance of power is changing between employers and employees. Wages are starting to accelerate; consumer confidence is sky high and business is investing. This environment creates a greater risk that inflation will rise and that the cost of money (interest rates) will be raised to a point that chokes growth. The current US bank base rate stands at 2.25%pa., which is roughly the same as inflation and investors are charging around 3%pa to lend the US Government money over 10 years. At these levels, we would accept that money remains cheap but the market expects the US Federal Reserve to increase the cost of money to 3.5%pa by 2020. Our fear is that they may have to go even higher or bring forward some of these rate increases given the strength of the US economy. We remain underweight US equities and this hasn’t been an enjoyable position as US shares have continued to rise, to new highs. Whilst new highs feel great, record high prices are rarely a harbinger of great value and our dilemma can be best explained by Amazon, a familiar company to most in the western world. Amazon is the second largest listed company in the world, with a market capitalisation of US$969bn and, despite being listed for 21 years, it has only been profitable on a financial accounting basis in the last 4. The company has very low margins, its net margin in the last reported year was 1.7%. The issue we have is the price of the stock which is trading on, wait for it, 294 times last year’s earnings. But that’s history. Looking ahead, if Amazon achieves its earnings estimates, then we need only wait 53 years before the company’s earnings repay the purchase price of the shares. We don’t believe Amazon shares offer any value but accept that the shares could still rise further before common sense returns. Amazon is but one example of the poor value. US equities have, to date, shrugged off the threat of tariffs on Chinese and other goods. The sense is that Trump administration wants to do a deal and news flow (aka tweets) on the NAFTA and EU area trade deals looks promising although nothing has been finalised. Our sense is some positive news on trade is likely to be announced before the US mid-term elections in November. European markets (including the UK) have been in the doldrums over the summer, the area mired in Brexit consequences, and the Emerging markets have hit a 14-month low. Such is the valuation gaps between the US and the rest of the world, we are finding it easier to invest in the UK, Europe and Asia even though this strategy has yet to bear fruit. Another reason we remain cautious is that this bull market is old, and we believe it is prudent to sacrifice some returns in favour of security. 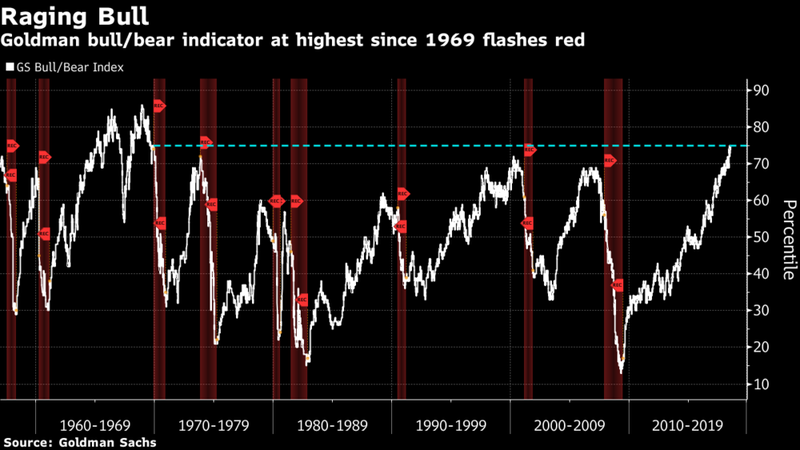 We are not alone as the Goldman Sachs bull/bear indicator, which was designed to provide investors with a reasonable signal for future risk of a bear-market, has risen to its highest level in almost 50 years. The shaded red bars show the periods when equities fell by more than 20% - the definition of a bear market. The Goldman Sachs’s Bull/Bear Indicator is based on the prices of shares, growth momentum, unemployment, inflation, the future price of money and is now at levels last seen in 1969. This doesn’t mean the bull market will end soon as this index has gone higher and given a false signal in the mid-sixties. However, after a near 10-year rally during which US shares have delivered an annual return of ~19%, investors should be prepared for lower returns in future years or a correction. To prepare for this, we have reduced risk in portfolios and added exposure to cheaper markets, absolute return funds, capital protected structured products and income yielding investments. Finally, there is an expectation that shares will become cheaper due to a price correction (a crash) and that, historically has been the case. Our bigger fear is that, with so much cash swirling around the globe, equites could become cheaper by trading sideways for a very prolonged period. Past performance is not a guide for future performance. The value of your investment can fall, and you may not get back the amount invested.